You know what they say about choosing your friends wisely. A friend should be someone you can rely on and will support you. Someone you can talk to and will give you their honest opinion. Well, PAM is anything but that. The only thing you can rely on PAM for is to give you is a Naegleria fowleri infection. That is why I say PAM is not your friend. What Is PAM and Naegleria Fowleri? Naegleria fowleri, often called the brain-eating amoeba, or brain-eating ameba, is a single-celled living organism that can cause a rare and destructive infection in the central nervous system of the brain. This infection is known as primary amebic meningoencephalitis (PAM). It is so serious that this brain-eating lover of warm water kills just about every person it infects. Naegleria fowleri infections typically occur throughout the U.S. during the summer months, although these infections are more likely to occur in the southern states where temperatures are higher. The median age for laboratory-confirmed PAM cases in the U.S. is 12 years, with the majority being male. Naegleria fowleri is most often discovered in fresh water such as rivers, lakes, and hot springs around the world, and sometimes in soil, according to Mayo Clinic. It thrives in hot temperatures up to 115 degrees and can survive when the temperatures rise beyond that. As the temperatures decline, the amoeba is less likely to be found. A person may be exposed to the amoeba through swimming and other water sports. 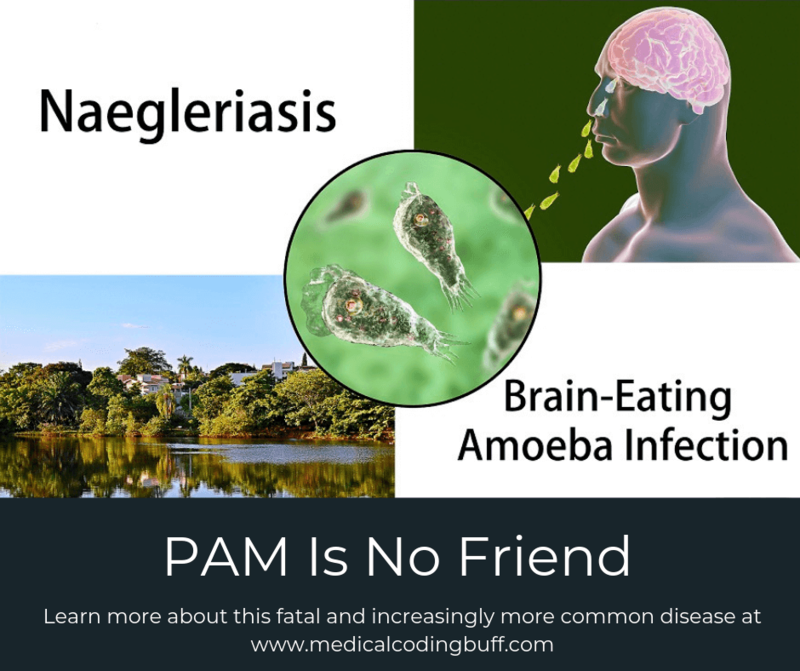 A gush of water that is contaminated with Naegleria fowleri goes up the nose and travels to the brain, resulting in severe damage known as primary amebic meningoencephalitis (PAM). This is usually a fatal condition. 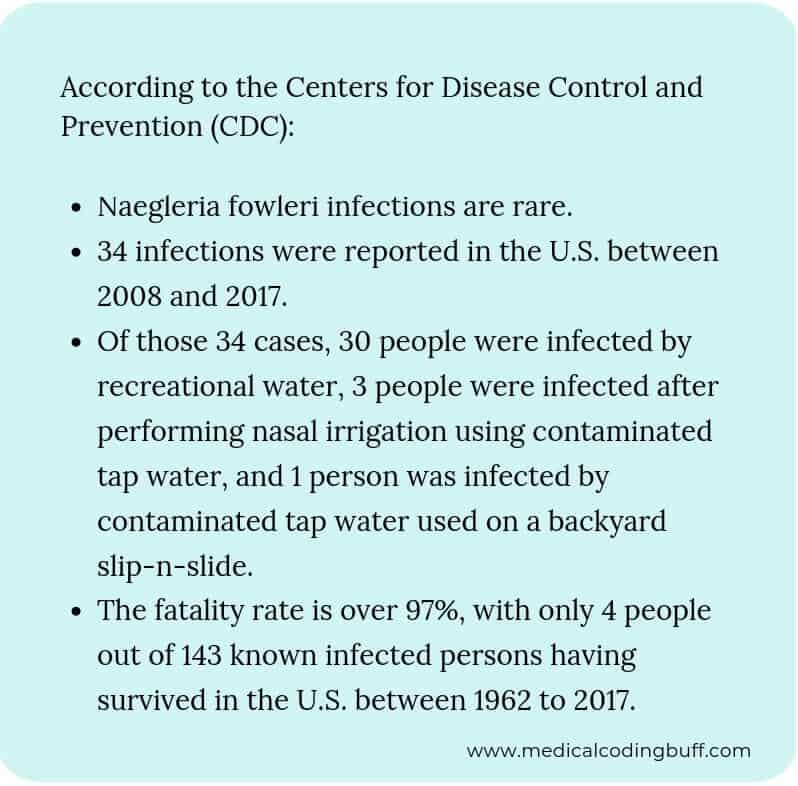 Naegleria infections may also occur in swimming pools that lack enough chlorine or in heated and contaminated tap water that enters the nose. Swimming in salt water. Naegleria do not live in saltwater. Being in contact with another person with Naegleria. Naegleria is not contagious. Signs and symptoms of Naegleria fowleri infection are similar to bacterial meningitis, which makes it more difficult to initially diagnose PAM. Symptoms of PAM begin 1 to 9 days after a person is nasally exposed to water contaminated with Naegleria, and people die 1 to 12 days after the symptoms begin. Accurate and early diagnosis of PAM is critical. Because PAM is so rare, it is often overlooked and misdiagnosed, and there have been insufficient diagnostic tests. Diagnosis of PAM can take weeks to identify the amoeba, resulting in approximately 75% of diagnoses being made after the patient’s death. Most patients who are alive at the time of diagnosis have such advanced disease that their chances of survival are slim, even with extensive treatment. Physicians should perform a complete and decisive clinical history and obtain information as to whether the patient has had exposure to freshwater, rhinitis, allergies, and other conditions of the upper respiratory tract, according to the Journal of Medical Microbiology. A computer tomography (CT) or magnetic resonance imaging (MRI) study of the brain can be performed to determine swelling and bleeding within the brain, but the findings look much like meningitis of different causes. A lumbar puncture (spinal tap) is the quickest and most accurate way to diagnose Naegleria amoeba. This can be performed by inserting a needle into the lower back between two vertebrae and removing a sample of cerebrospinal fluid (CSF) and then examining it under a microscope. Direct visualization: When viewing a fresh infected sample of CSF under a microscope, amoeba can be seen moving quickly. For further identification, the amoeba can be stained with such stains as Giemsa-Wright or a modified trichrome stain. Antigen detection: An antibody to Naegleria fowleri can be used in combination with another antibody that transfers a chemical or glows under certain types of light to stain the amoebic antigens in tissue. Polymerase Chain Reaction (PCR): Certain molecular tools can magnify the Naegleria fowleri DNA and identify amoeba in CSF or tissue if present. Viewing strains or subtypes of Naegleria fowleri can also be done, but without more knowledge about the natural populations in the environment, it is difficult to discern the meaning of the findings. Amoeba culture: The amoeba can be grown in culture, which makes it more likely to detect the amoeba by direct visualization or PCR. This is performed by taking biopsied or corneal scrapings, vitreous fluid or tissue and isolating the parasites in a growth plate with bacteria. The bacteria serve as food for the parasite, and this screening process causes detection by visualization. Environmental detection: Water samples can be collected, concentrated, and placed in culture to grow and select for Naegleria fowleri. Testing of the samples can be done using the culture or molecular methods. The amoeba culture method is the most commonly used method of testing. According to the CDC, there have only been four survivors of PAM in the U.S, the first survivor dating back to 1978. The patient’s recovery was attributed to a less potent strain of Naegleria fowleri. In 2013, a 12-year-old girl was diagnosed with PAM about 30 hours after feeling ill. Within 36 hours, she was started on the previously recommended treatment combination of Amphotericin B, rifampin, fluconazole, azithromycin, and dexamethasone. Miltefosine, an anti-parasitic, was an investigational drug at the time and was also administered, along with aggressive management of brain swelling that included therapeutic hypothermia. She had a full recovery. They attributed her recovery to early diagnosis and treatment, along with the miltefosine and hypothermia. In the same year, an 8-year-old male was also diagnosed with PAM and treated with miltefosine but was not diagnosed and treated until several days after his symptoms started. Therapeutic hypothermia was not used. He survived but suffered probable permanent brain damage. In 2016, a 16-year-old boy was diagnosed within hours of presenting to the hospital and started on the same protocol as the 12-year-old survivor in 2013. He made a full recovery. The CDC reports that it is still unclear whether there is an effective treatment for Naegleria fowleri infections, because most infections have proven fatal. Further tests are being developed to treat the amoeba. Currently, however, based on the treatment provided in the four survivor cases, the combination of drugs recommended for treatment are Amphotericin B, rifampin, fluconazole, azithromycin, dexamethasone, and the new drug, miltefosine. Aggressive management of brain swelling is also part of treatment. What is known for certain is that treatment needs to be started immediately upon rapid detection in order to save the patient. An infectious disease doctor should be also be consulted. The effectiveness of this drug combination varies based on the stage of the cultures. A 12-year-old female presented to the emergency department with fever of unknown cause. A lumbar puncture was performed, and cytopsin slides of Wright-Giemsa and Gram stained cerebrospinal fluid (CSF) (CPT: 87081) showed many organisms. Well-trained technologists in the microbiology laboratory identified the organisms as being consistent with Naegleria species and contacted the emergency department within 75 minutes of their diagnosis. The patient was treated for PAM (ICD-10-CM: B60.2) with amphotericin, rifampin, azithromycin, fluconazole and aggressive supportive therapy including dexamethasone. The facility contacted the CDC and immediately started miltefosine. An intraventricular shunt was placed, and therapeutic hypothermia was used to lessen the severity of any potential brain swelling. The patient made a full recovery. The best way to prevent Naegleria fowleri infection is to avoid fresh water activities. Other ways to reduce risk are to wear nose clips or plug the nose, keep the head above water, and refrain from swimming, diving, or jumping into warm, still, salty water with loose bottom sediment. PAM is an acute and fatal disease that has become increasingly more common throughout the U.S. and the world. Early diagnosis and aggressive treatment are key to saving patients’ lives. Currently, the outcome is poor for people diagnosed with PAM. However, with each new case brings new approaches that are discovered, and these will potentially lead us further away from a death sentence. I wrote the above article, and it was first published in BC Advantage/www.billing-coding.com under the title, “Believe Me, PAM Is Not Your Friend” and is reprinted here with permission. BC Advantage provides great resources for medical coders, medical billers, and others in the industry. Do You Know the Difference Between a Craniotomy and Craniectomy?